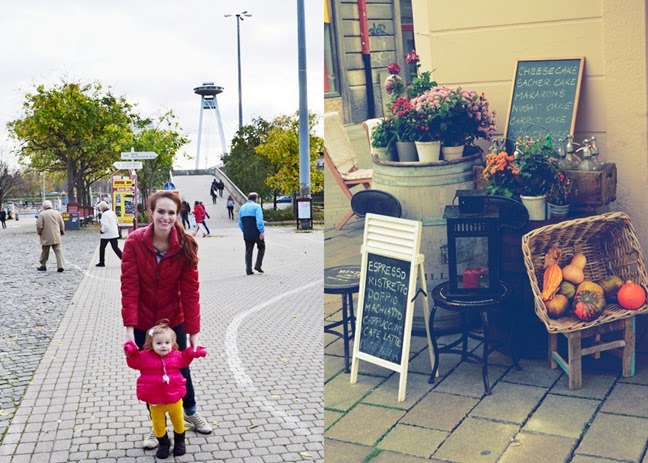 After our morning adventures in Vienna we took advantage of our close proximity (just 30 miles) to another country and headed to Bratislava, Slovakia. Never in a MILLION years did I ever think I'd be visiting this country. All growing up you heard "Slovakia" and you immediately thought "Scary". But keep reading and you'll come to see that it's a very different place than it once was. 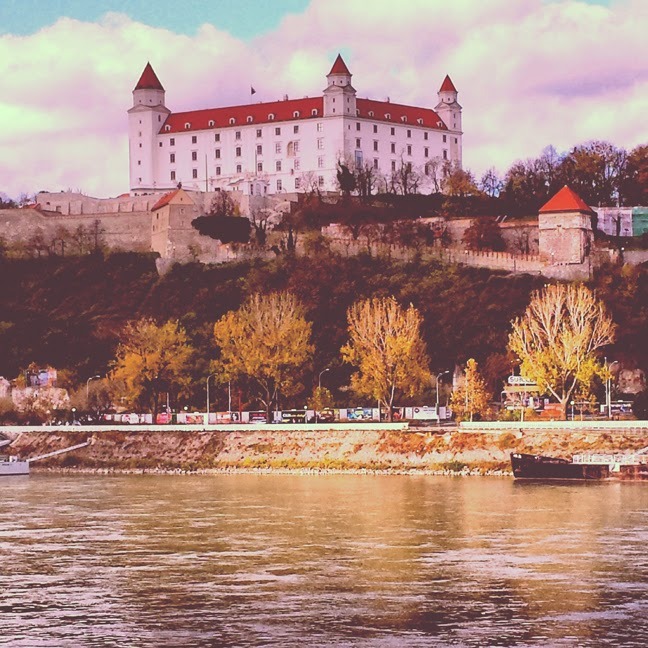 Bratislava's priceless location - on the Danube (and the tourist circuit) smack-dab between Vienna and Budapest - makes it a very worthwhile destination. Long a drab lesson in the failings of the communist system, the city is turning things around. 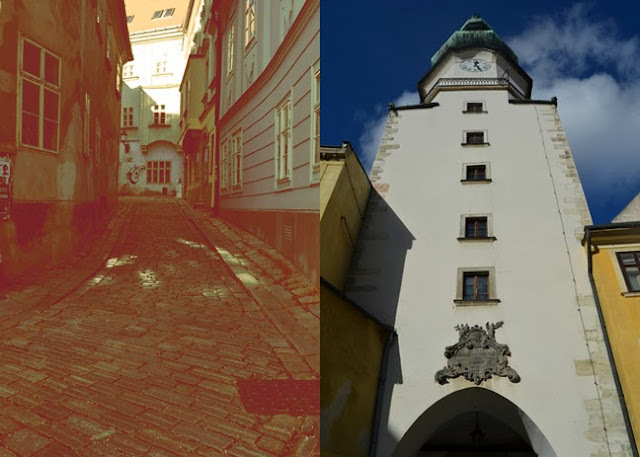 Just a decade ago Bratislava's city center was grim, deserted, and dangerous - a place where only thieves and fools dared to tread. Today it's downright charming, bursting with colorfully restored facades, lively outdoor cafes, swanky boutiques, in-love-with-life locals, and (on sunny days) an almost Mediterranean ambiance. The rejuvenation doesn't end in the old town. The ramshackle quarter to the east is gradually being flattened and redeveloped into a new forest of skyscrapers. 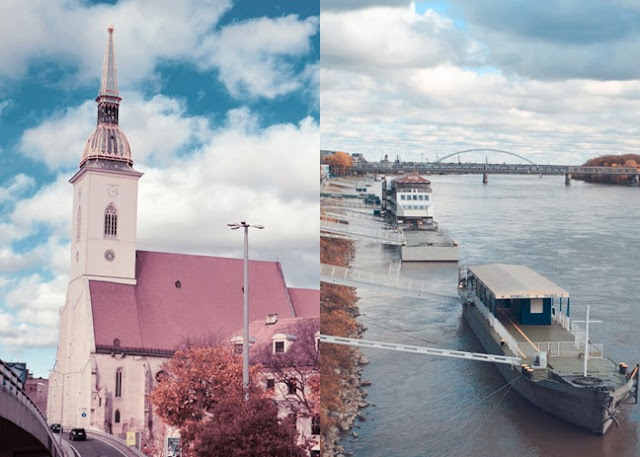 Bratislava is working tother with its neighbor Vienna to forge a new twin-city relationship for trade and commerce, bridging the former Eastern Europe and the former Western Europe. 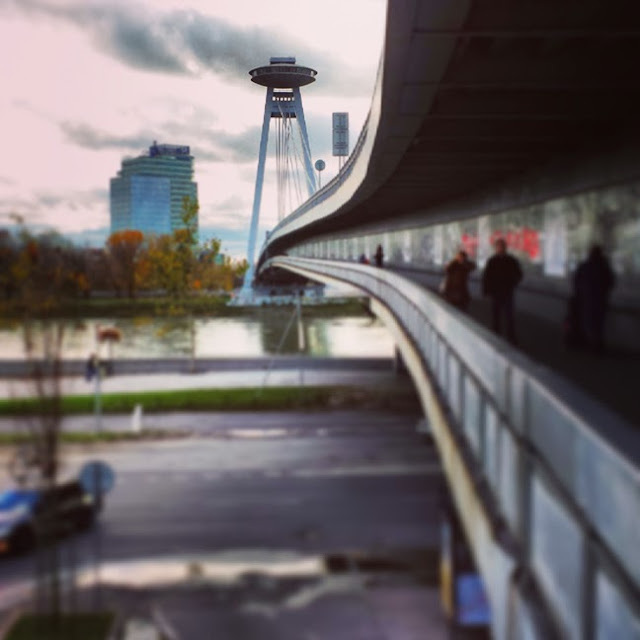 Before our eyes Bratislava is becoming the quintessential post-communist Central European city - showing us what can happen when government and business leaders make a concerted effort to jump-start a failing city. 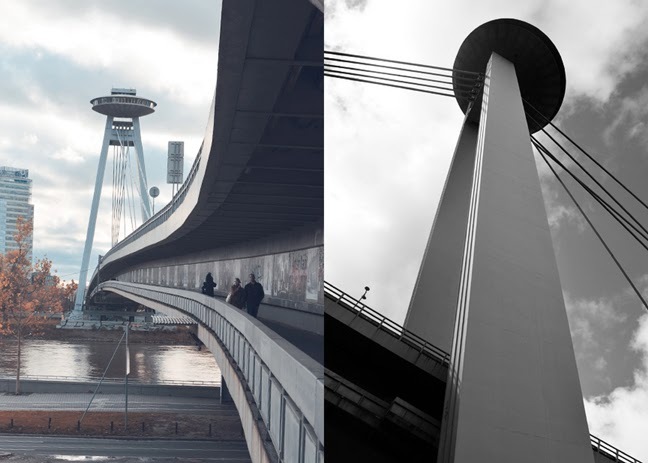 And yet, it's still a city in transition, with sometimes striking contrasts. Tucked between the quaint old town and super-modern Euro-commerce zones, large pockets of post-communist decrepitude remain. There's a reason why movie makers wanting to show the stereotypically gloomy "communist Eastern Europe" decide to film here... But all of the changes are positively inspiring. While they still have a long way to go, the Slovaks have made the city well worth a quick visit to get a glimpse of a country in transition. We banked on a few hours to get the gist of Bratislava and were happy with the amazing views we got as we delved deeper into the city center - both the castle and the iconic UFO in one shot! 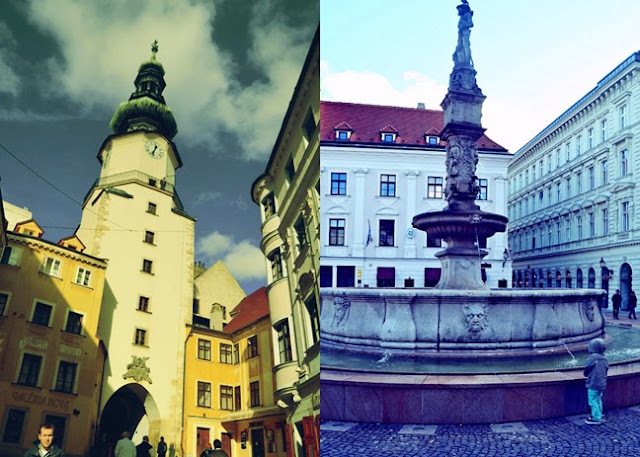 Bratislava, with nearly a half-million residents, is Slovakia's capital and biggest city. It has a small, colorful old town with the castle on the hill above. The small area is surrounded by a vast construction zone of new buildings, rotting residential districts desperately needing beautification, and some colorized communist suburbs. Eventually the highway that barrels between the old town and the castle will be diverted underground; the TGV bullet train from Paris will swoosh to a stop at a slick new train station; and a new six-station subway line will lace the city together. The entire riverfront is being transformed into a people-friendly park to match the new zone beyond the old iron bridge in Eurovea. I'm excited to see how this country grows! Slovakia uses the same currency as Austria and Germany - the Euro. While many people in Bratislava speak English, the official language is Slovak - closely related to Czech and Polish. Slovakia is about the size of Massachusetts and New Hampshire combined (19,000 square miles) with a population of 5.5 million. Slovakia has spent most of its history as someone else's backyard. For centuries Slovakia was ruled from Budapest and known as "Upper Hungary." At other times it was an important chunk of the Habsburg Empires, ruled from Vienna. But most people think first of another era: the 75 years that Slovakia was joined with the Czech Republic as the country of Czechoslovakia. From its start in the aftermath of World War I, this union of the Czechs and Slovaks was troubled. They gained their freedom from the communists during 1989's peaceful "Velvet Revolution" and then separated from the Czech Republic with the "Velvet Divorce" in 1993. At first the Slovaks struggled. Communist rule had been particularly unkind to them and their economy was in shambles. Visionary leaders set forth bold solutions including the 2003 implementation of a 19% flat tax followed by EU membership in 2004. Before long, major international corporations began to notice the same thing the communists had: this is a great place to build stuff thanks to a strategic location (300 million consumers live within a day's truck drive), low labor costs, and a well-trained work force. Today Slovakia produces one million cars a year, making it the world's biggest car producer per capita. Bratislava has only 3% unemployment and is 10th place among European cities for the standard of living. While most of Europe is struggling through difficult economic times, much of Slovakia seems poised for its brightest future yet. We parked the car in an underground garage and emerged back into the real world to find our starting point for the self-guided city walk. The walk started at the green onion-domed steeple of St. Michael's Gate and we peeked over the side railings to see inviting gardens - once part of the city moat. St. Michael's Gate is the last surviving tower of the city wall. Underneath the gate we found the "kilometer zero" plaque in the ground, marking the point from which distances in Slovakia are measured. Then we walked down Michalská Street. Pretty as it is now, the original medieval street cobblestones were sold by the commies to cute German towns that were rebuilding themselves after WWII. The new government in 1989 carefully and thoughtfully restored the old town to the charming place we saw today. Above the chocolate shop's entrance, a cannonball is embedded in the wall, commemorating Napoleon's two sieges of Bratislava, which together caused massive devastation - even worse than the city suffered during WWII. 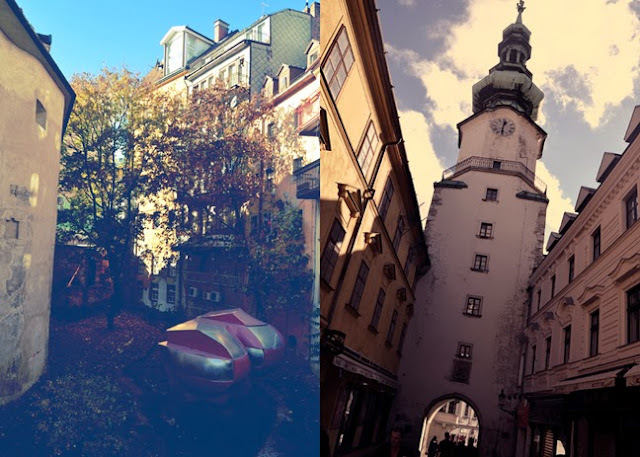 Apparently there are cannonballs all over town - somber reminders of one of Bratislava's darkest times. 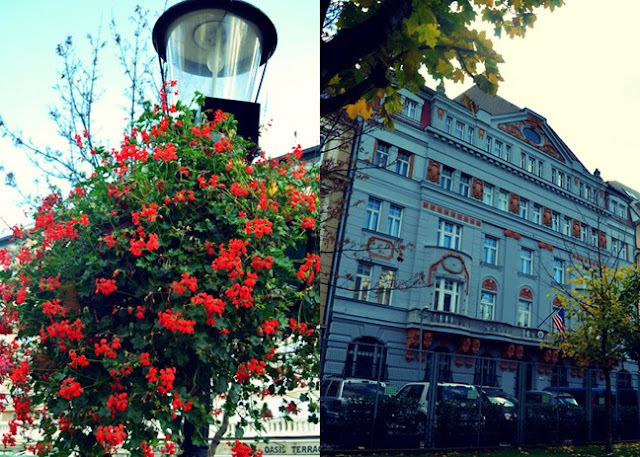 At the end of Michalská Street we turned left along Sedlárska and headed for... Main Square! This is the bustling centerpiece of Old World Bratislava. Cute little kiosks sell local handicrafts and knickknacks Easter through October and similar stands fill the square from mid-November until December 23rd when the Christmas market here is a big draw. Juuuuust barely missed the Christmas markets dangit! Virtually every building around this square dates from a different architectural period. Peering over one of the benches in the Main Square is a cartoonish statue of a Napoleonic officer. With bare feet and a hat pulled over his eyes, it's hardly a flattering portrait - the Slovaks' revenge for the difficulties they faces at Napoleon's hands. 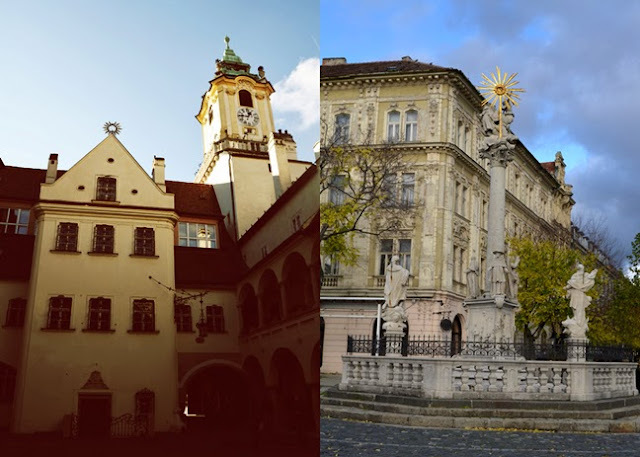 At the top of the Main Square is the impressive Old Town Hall marked by a bold yellow tower. We found another cannonball embedded in the facade. They just paint right around them! We stepped through the Old Town Hall into the gorgeously redecorated and restored courtyard. This pink mansion is Primate's Palace. Primate's Palace is a neoclassical palace, built from 1778 to 1781 for Archbishop József Batthyány, after the design of architect Melchior Hefele. In 1805, the Palace's Hall of Mirrors saw the signing of the fourth Peace of Pressburg, ending the War of the Third Coalition. Today, it serves as the seat of Mayor of Bratislava. Back into the Main Square, we saw this charming vehicle - looks fun! Down through Main Square we continued to Rybárska Brána where we found a whimsical statue. Playful statues dot Bratislava's old town. Most date from the late 1900s when the city leaders wanted to entice locals back into the newly prettied-up center. 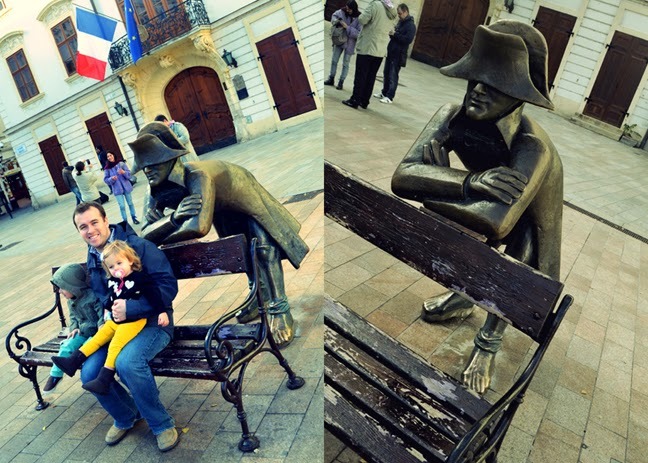 This jovial chap is a statue of Schöner Náci who lived in Bratislava until the 1960s. This eccentric old man, a poor carpet cleaner, would dress up in his one black suit and top hat and go strolling through the city, offering gifts to the women he fancied. He'd often whisper "schön" - German for "pretty" - to those women which is how he got his nickname. At the end of the block is "the Peeper," grinning at passersby from a manhole. 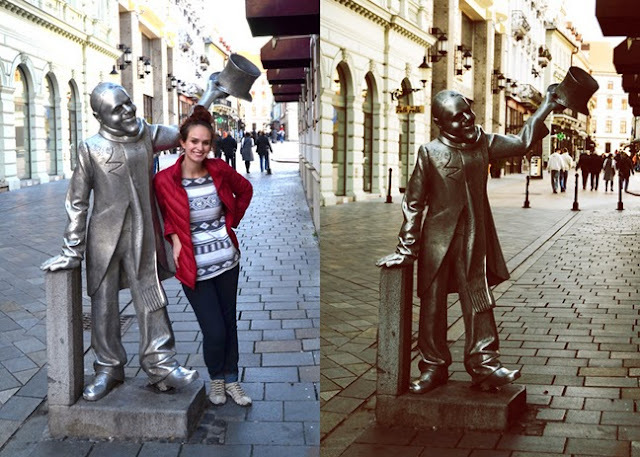 This was the first and is still the favorite of Bratislava's statues. There's no story behind this one - the artist simply wanted to create a fun icon and let the townspeople make up their own tales. The Peeper probably gets driven over a lot. 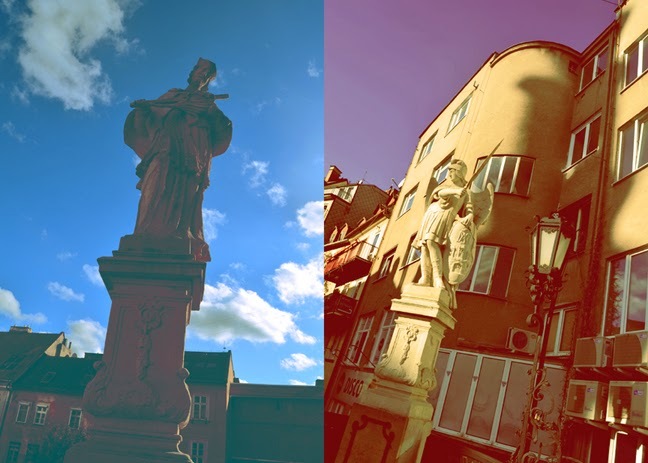 We reached the long and skinny square called Hviezdoslav Square where the Slovak National Theater stands. The Slovak National Theater is the second oldest Slovak professional theatre. It has three ensembles: drama, opera, and ballet. It was founded in 1920 after the creation of Czechoslovakia and became a state-run company in 1945. The Slovak National Theatre has represented Slovak culture on its numerous tours abroad. 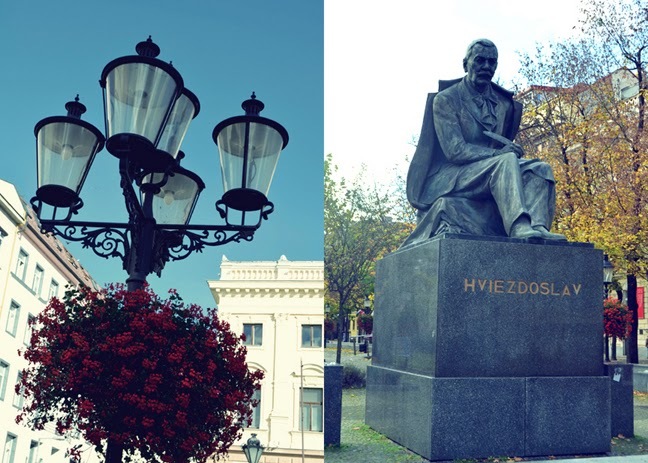 Pretty street lamp and a statue of Pavol Országh Hviezdoslav whom the street is named after. He was a beloved Slovak poet. Another pretty street lamp and the fortified US Embassy. Naturally surrounded by guards and gates galore. 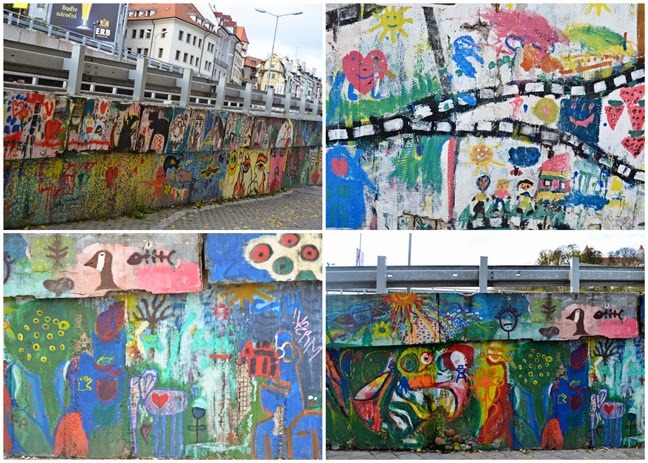 We strolled down the long art-and-people-filled park nicknamed "The Promenade." At the end of the street we turned left to cross New Bridge, the communist's pride and joy. As with most Soviet-era landmarks in former communist countries, locals aren't crazy about this structure - not only for the questionable starship Enterprise design, but also because of the oppressive regime it represented. However, the restaurant and observation deck up top has been renovated into a posh eatery called (appropriately enough) UFO. We wanted to go up to the top of the UFO, but it was closed for a private party. Ahem, why were we not invited?! We got a spectacular view of Bratislava Castle from the other side of the river. Fall is still hanging on! We walked back across the bridge towards St. Martin's Cathedral. Before the cathedral we came upon the site of Bratislava's original synagogue. It's now just an etching of the original building carved into a slab. The word "Remember" in Hebrew and Slovak is carved into the base of this Jewish memorial which commemorates the 90,000 Slovaks who were deported to Nazi death camps. Nearly all were killed. 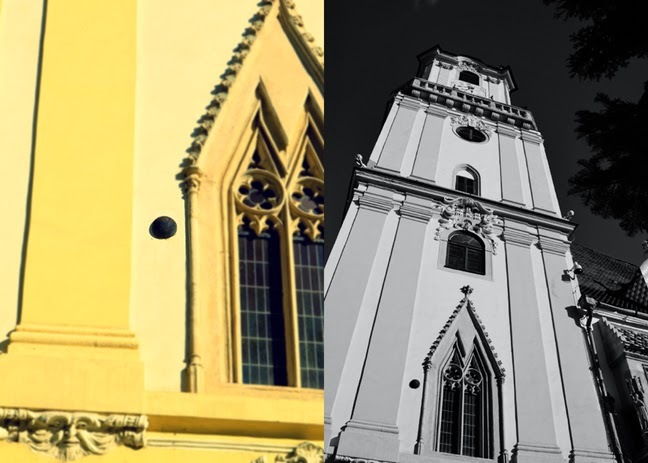 The fact that the town's main synagogue and main church were located side-by-side illustrates the tolerance that characterized Bratislava before Hitler. 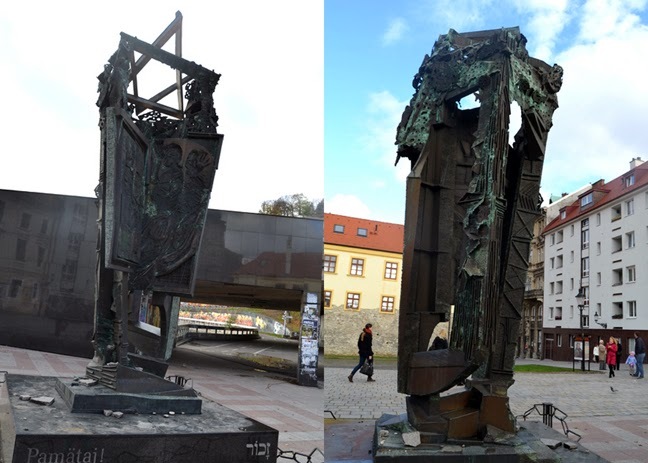 This modern memorial has two pages of an open book, faces, hands in the sky, and bullets - all under the Star of David - and evokes the fate of 90% of the Slovak Jews. Buildings leading up to St. Martin's Cathedral. Part of the old 15th-century city wall. This historic church isn't looking too sharp these days and the highway thundering a few feet in front of its door doesn't help matters. Sad as it is now, the cathedral has been party to some pretty important history. 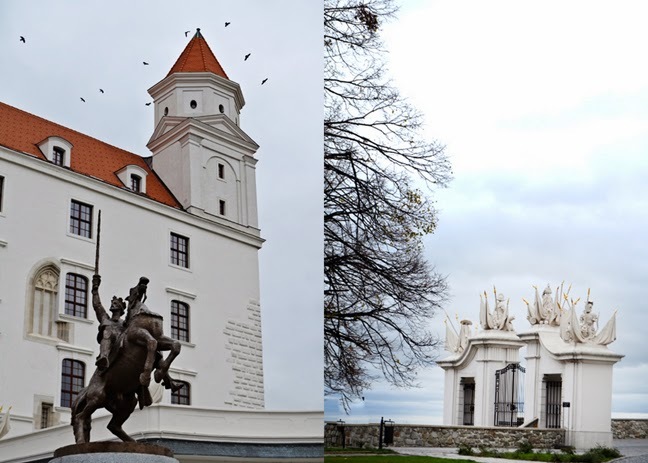 While Buda and Pest were occupied by Ottomans for a century and a half, Bratislava was the capital of Hungary. Nineteen Hungarian kings and queens were crowned in this church - more than have been crowned anywhere in Hungary! In fact, the last Hungarian coronation was not in Budapest, but in Bratislava. A replica of the Hungarian crown still tops the steeple. We would have liked to go inside to see such an important church, but alas, it was Sunday and not open to tourists. Then we tried to find Bratislava Castle. Our GPS steered us in the very wrong direction, but it was cool to explore some of the more seedy parts of town. With the doors locked and windows shut of course. We finally figured out the right address and quickly drove by Grassalkovich Palace (the residence of the president of Slovakia) on our way up to the castle. Across from the street where we parked our car is the Parliament. There were murders of crows flying everywhere, kinda spooky if ya ask me! The entire Parliament building. 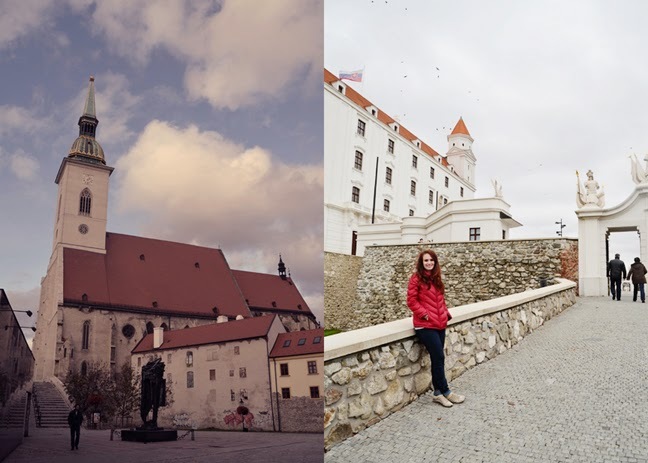 Bratislava Castle in all its glory! The imposing fortress, nicknamed the "upside-down table"is the city's most prominent landmark. There surely has been a castle on this spot for centuries as is evident from the old foundations in front of the castle. They just built right around old windows! Fascinating! Fancy gates to get into the castle court. My favorite part was the views of Bratislava. Boxy buildings given a facelift with paint! And then the city ends and it's green as far as the eyes can see. Such an interesting looking place! I've never seen anything like it! Then it started raining and getting cold. Luckily we were done with all we wanted to see and do so we loaded back into the car for the short 45 minute drive back to our apartment in Vienna. We ordered pizza to go from the restaurant below and to the left of our abode. The next morning we planned to go to Schönbrunn Palace AND Belvedere Palace, but it was raining cats & dogs and the kids were so done. 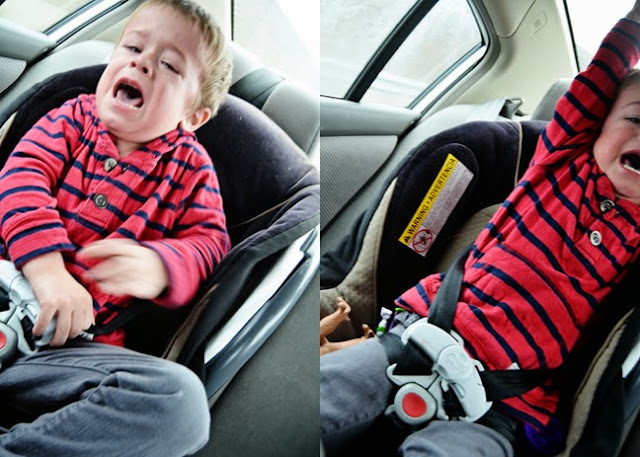 These pictures sum up our 5 hour drive home to a "T". Other than the drive home, we had an AMAZING time in Vienna and Bratislava! I can only hope to go back and do some of the things we missed out on this time, some other time! Loving the photos .. those statues are so fun!! Poor Fox!! What an awesome city! Gerrit's great-grandparents immigrated from Slovakia and I know his mom really wants to go. I think they were from further out in the country, though. And those pictures of Fox crying in the car! Yikes! No kids for us for a VERY long time!! I love reading about your adventures! My husband and I are stationed in Papa Hungary, and have done most of the trips you post about. It's funny because I'll skip over to your blog to see if I've missed any history. You keep me on my toes. I'm happy the weather cooperated with you for the Bratislava leg of your trip. Last weekend my family and I headed to Brasov Romania to visit Bran Castle. The castle was interesting but the city and scenery was over the top. If you have the chance definately recommend!! Here's to continuing adventures in Europe!! So Cool. My brother just got home from his mission 3 months ago from serving in that exact town. He LOVED. it.